I recently ran a half marathon – yes, I ran a half marathon pregnant. 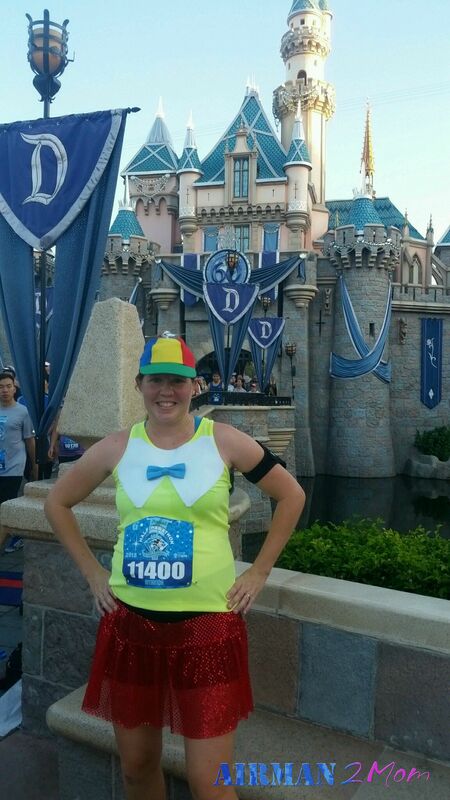 I was 6 months pregnant, 24 weeks plus a few days if you are counting, but it was a Disney half that I signed up for in Feb and there is no way to get your money back and my training partner needed someone to run her first half marathon with. We trained together and it was a lot of fun. Each month I would get bigger as the big day arrived. We would often laugh about the different looks we would get from various people, as we would run along the path near the beach. Friends were a little worried about me. They sent a lot of prayers up for the big weekend. And most have them must have prayed for the actual race, because that was what I was focused on too. But we needed prayer more for the weekend leading up to the race. Than when I ran a half marathon pregnant. We had trained for the race, but were not quite ready for all that was in store leading up to the big day. We arrived at Disneyland got our packages and were ready for the race so we headed to our hotel. As we checked in there was one minor, I mean major issue. For some reason when I booked the hotel I had booked a king bed instead of two queens. We had four people for our room and sleeping on the floor the night before the marathon wasn’t really an option. The hotel was completely sold out so there wasn’t anything they could do. They called next door and found us a room. As two of the girls walked over to the new hotel, someone else walked in and took the room on hold for us. We were back to not having a room. Panic began to set in. A quick internet search told us that all rooms in Anaheim were taken. While I wandered off to find a bathroom, my friend stood waiting at the front desk, praying. The lady at the front desk was being inundated by phone calls and while she waited for help she also prayed. But not just “please help us God.” She prayed that someone would call and there would be a cancelation and within minutes someone did. The hotel we originally booked had a cancelation and had a room for us. It was an amazing answer to prayer and I loved how specific her prayer was. Most of my prayer life is generalities. I normally don’t ask God to do something specific. I’m not sure if it is because my faith isn’t big enough or if it just isn’t something I regularly do. Probably a little bit of both, but the amazing thing about specific prayers is that you get specific answers. How often are we to afraid to simply just ask God? You will be surprised when you actually ask Him for help, guidance or whatever the situation may be. He cares more about our lives than we realize and sometime it is because we are afraid to ask. As the weekend continued God continued to open doors. When we got to an overcrowded restaurant there was an open table at the bar. When traffic was deadlocked and it seemed that we would miss the start time for the race traffic began to flow. Prayer for everything that happened through out the weekend was truly a theme that powered us through. It was an unexpected lesson I learned that weekend. God is in all parts of our lives. Big and small. He helped us with finding a place to stay, getting us food and to the race and even kept all three of us healthy. We all completed the huge task of running 13.1 miles. Over a month later I am still reflecting back to that weekend. It set in motion a heart ready to hear what God had to say to me leading up to MOMcon. It gave me time with friends that moms savor. It helped me accomplish a goal. I ran a half marathon pregnant. It still seems like something a little bit beyond the scope of reality. This is part 3 of a series on training and running a half marathon while pregnant. I love your inspiration story about meeting God in everything. I find that to be so true and love your tenacity to keep moving forward. Thanks for sharing. I know, I was like it is my fault that we booked the wrong room so I should be the one sleeping on the floor. I’m so glad it didn’t end up that way. I love how God can teach us so much when we don’t even expect it. Great post Amanda 🙂 And, CONGRATS for doing a half-marathon when pregnant!! Love the scriptures you shared & the testimony on God’s faithfulness! Have a great day. Keep going in this #write31days journey!! Thanks. I’m actually not doing 31 days this year, but love being part of the great 31 day community and this group is my favorite thing from last year. I’m so glad you enjoyed my post! Thanks for stopping by. Hurray for the power and effectiveness of specific prayer! It is evident that this answered prayer (in many areas) built up your faith and closeness to God and other ladies you were with. These are the stepping stones of maturity. I read the linked article (What Does Wellness Mean? ), and I was struck most by this line, “If you could share one wellness tip with military spouses it would be to not let your circumstances give you a reason to not be healthy.” . . . This is soooooo true for anyone. While I don’t have a military spouse (anymore), I could let my circumstances overwhelm me and let myself make bad health decisions. I am going to be pondering some more on your quote. The Wellness post was selected to be one of the featured posts for the Summit next week and I wasn’t really sure how I was actually selected, but I guess I got some wisdom and a few nuggets we can all use and was able to share them. Thanks for reading and commenting. I love how this post tied directly to so many other things going on right now. Wow! How awesome is that? I think I am guilty of what you said about not praying specifically. In my case think it is due to doubt, unfortunately. Great verses though. I am challenged by this and I am going to refocus my mindset and ask the Lord to lead me in my prayers. I’m so proud of you! You’ll always remember this.